Junior Garrett Heine uses the technical skills he developed playing at home in California to control the ball during a game against Rhode Island on Saturday. Heine is tied for sixth nationally with four game-winning goals. It may have taken three years, but it seems like everything is starting to fall into place for junior forward Garrett Heine and men’s soccer. The Colonials haven’t played post-season soccer since 2011 and finished last year 6‒9‒2 (2‒4‒2 in the Atlantic 10) while scoring just 17 goals in 17 games. GW was picked in the 2015 preseason poll of the conference’s head coaches to finish 10th out of 13 teams. And out of the gate, it seemed like that was going to be the case. 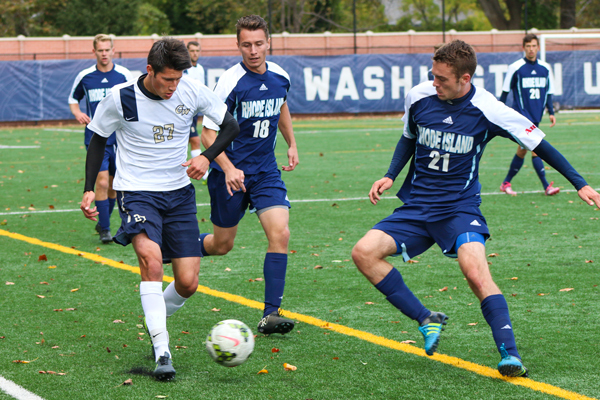 Head coach Craig Jones could not find a lineup that jelled, and GW started the season 1‒4. However, despite the early season struggles, one thing remained consistent: Heine was producing. Since the season got underway in late August, Heine has been the most dangerous player on the pitch, game in and game out. After 13 games, the San Diego native leads the Colonials and ranks second in the Atlantic 10 in goals (6), goals per game (0.50), points (15) and points per game (1.25). In addition, Heine ranks fifth in the nation with four game-winning goals. With Heine and sophomore forward Christian Lawal, who saw limited minutes due to injury in the first five games of the season, the Colonials continue to create dangerous opportunities in the offensive third, which led to a five-game win streak only recently snapped by the University of Rhode Island on Saturday. Heine and the juniors are part of Jones’ first recruiting class, so the core of the team trusts each other and is more experienced than in years past. With a starting lineup consisting mostly of upperclassmen, GW has played confidently and composedly down the stretch. The Colonials have won five one-goal games, which seems to be the difference between this year and last. Over the summer in San Diego, Heine played for a U-23 men’s league that frequently matched up against professional clubs. The west coast is said to typically play more technically, with the focus being on possession and passes on the ground. On the east coast, teams try to play through their opponent, emphasizing on physicality and toughness. But for Heine, getting recruited to play Division I soccer was by no means the perfect process – it took a few bumps in the road for the stars to align. Though he was captain of his academy team sophomore year in high school, programs began to drop Heine from their recruiting lists during his junior year when he struggled to see the field. Senior year on a new club team, Heine had a breakthrough tournament and later got a call from Jones, asking him to commit to GW. You may also see Heine longboarding from class to class with his two roommates, junior midfielder Angel Valencia and junior defenseman Tobi Adewole. In the off-season, Heine likes to explore D.C., surf at home in San Diego and go skiing in the winter with his family. He started when he was little, and has skied at resorts all over California, Canada, Utah and Colorado. Though Heine leads the team in goals, by no means is he a selfish player. With three assists on the year, Heine is always involved in scoring opportunities and allows his teammates to play better offensively. Heine’s hybrid of an east and west coast-style of play fits well with how Jones wants his team to compete – quickly, physically and technically. With four games remaining, the Colonials will look to make their first A-10 tournament bid for the first time in five years. And with Heine’s right foot, it seems like anything is possible.